What�s glitz, glamour, poise and talent without five o�clock shadow? PAGEANT: THE MUSICAL�s beauty �queens� have it all, and as emcee Frankie Cavalier puts it, there�s also �something extra� in this production of the farcical Off-Broadway hit that�s a send up of beauty pageants. The musical, from Executive Producer Alan Finkle, Producer Dustin Lewis and 2 Fat Farmers Productions, showcases six of the most beautifully radiant lads, uh, �ladies� to ever grace an Atlanta stage. Miss Deep South, Miss Bible Belt, Miss Industrial Northeast, Miss Great Plains, Miss Texas and Miss West Coast will take the stage and steal your hearts while competing for the crown and the title of �Miss Glamouresse �at the Woodruff Art Center�s 14th Street Playhouse beginning Wednesday, August 25th. And the winner is? Well, that�s up to you, because the audience decides every night in the Atlanta professional premiere of this hilarious, over-the-top spoof. You will never again judge any pageant the same way! 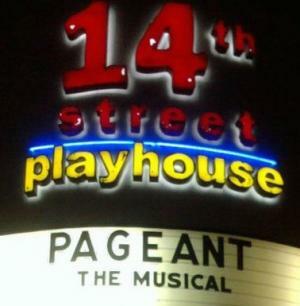 Called �screamingly funny!� by the New York Times, PAGEANT is a beauty contest unlike any other. So, practice your winner�s wave and come see if a baton-twirling �lady� can really �cure� world peace! The question on the table today is, just what is beauty? Philosophers and teenagers since the dawn of man have studied that question, and, my research indicates that a satisfactory answer is yet to come. The old-fashioned beauty pageant used to have its finger on the pulse of beauty � Miss America was held up as �the standard� against which every girl and woman found herself measured. As such, beauty pageants are a fertile ground for a musical. An adaption of the 1975 movie, �Smile,� tried and failed a number of years back. Now comes �Pageant,� a musical by Bill Russell, the writer-lyricist of �Side Show,� settling into the 14th Street Playhouse for the next two months. It�s a decidedly mixed bag affair � a number of excellent performances, one or two decent numbers, a fair share of laughs and double-entendre jokes, but it�s almost sunk by an overall sense of patronizing contempt, and a penchant for creating characters who are little more than negative stereotypes. And, no attempt is made to get �backstage� or �behind the scenes.� We just see the pageant itself, and, when the winner is chosen, the play is over. To make matters worse, this is a decidedly �low=rent� pageant, sponsored by the �Glamoresse� make-up company to find a product spokeswoman. To get the main feature out of the way first, the contestants are all men in drag. One gimmick is that we are not witnessing a �drag� Beauty Pageant, but a traditional one with no pretense that the contestants are anything but women (a few �something extra� jokes notwithstanding). Another gimmick is that selected audience members are the actual judges, so the �winner� of the pageant will necessarily change from performance to performance. Well, no! Just because you have a man playing the role, doesn�t mean you�re not exploiting HIM in the same way. I suppose that�s okay, though. What�s really exploitative is the disdain the writers have for these women, all of whom are dim-witted stereotypes � Miss Texas is a gun-totin� roustabout, Miss Deep South is a genteel antebellum magnolia, Miss West Coast (named �Karma,� for heaven�s sake) is a dumb-blonde valley girl, Miss Bible Belt is a black Hallelujah-whore, Miss Great Plains is an awkward hayseed, and Miss Industrial Northeast is cartoon-accented Hispanic. Even the oily emcee is little more than a smarmy lounge lizard. Would it have been so difficult to make ANY of these characters play something other than a stereotype, something other than a pageant-hater�s notion of what a beauty contestant is really like? Would it have been so difficult to make some of them actually smart or talented? Compare this with Mr. Russell�s script for �Side Show,� which is filled with affection for the freaks and geeks in the story. I mean, let�s be honest here � if the writer has such little regard for his characters, why on earth should we? If all the contestants are so blissfully unaware of their own �bad talents,� why should we even want to watch them? Yes, the first badly done bit is funny, the second maybe even more so. But by the fifth and sixth, I just wanted them to stop. I also have to confess a fondness for the various �Glamoresse� commercial spots, featuring every bad make-up idea that could ever be conceived. Unfortunately, the first of them was the most outrageous, and it made those that followed a tad anti-climactic (pun intended). So, this is a show that could find an audience � it does have laughs and pleasures that can�t be denied. The audience also has a good time at intermission trying to match-up head shots with their on-stage counterparts. And, at one point, I thought it would be fun at the end of the run to tally up how many times each character wins the pageant. But, then it occurred to me that, since the writer of this piece doesn�t especially care who wins, there�s no reason for us to either.